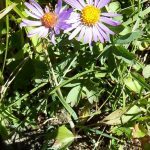 One of our favorite activities when hiking is identifying Glacier Park Wildflowers. In years past, our wildflower books were always on the list of items to pack when heading out on our day long treks. Now we’ve become a little higher tech and I have the Glacier National Park Wildflowers reference book by Shawn Wesley Coggins and the Glacier Park Wildflowers reference book by Bret Bouda on my iPad that I carry that with us on our treks. 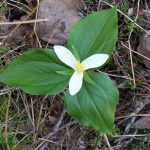 Flower season in Glacier National Park begins in May and continues throughout the summer, and by August, you can find wildflowers on nearly every trail at all elevations. 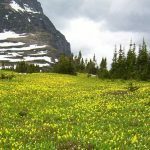 In this post, I’ll cover some of the wildflowers you may encounter while visiting Glacier National Park. 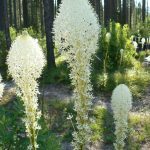 Beargrass is one of the iconic Glacier National Park Wildflowers. The plant consists of an evergreen dense clump of grasslike leaves at it’s base. 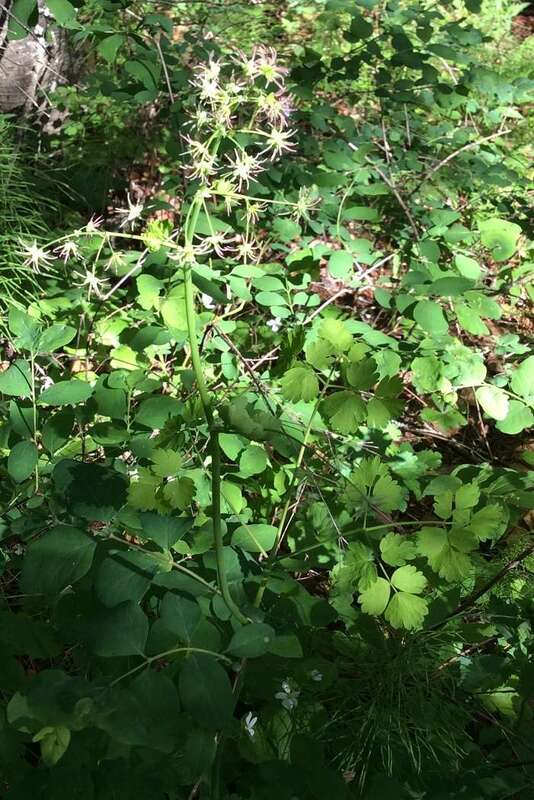 The leaves are 1-2 feet long and wiry. 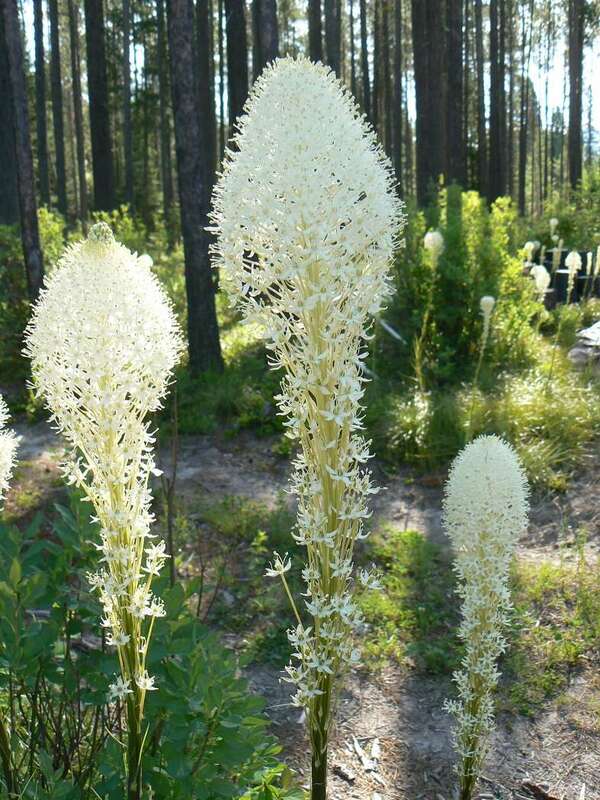 Beargrass bloom about once every 7 years. When blooming, they send up a long stem with grasslike wiry leaves that get progressively shorter. At the top of the 3-5 foot stem is a dense cluster of small white flowers in a conical shape. 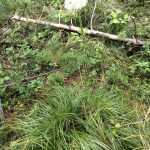 Beargrass prefer well drained open woods and clearings. At lower elevations they will bloom in late May or June. But in the Garden Wall section of the Highline Trail, blooming Beargrass can be found until late August or even early September. Another iconic Glacier National Park Wildflowers is the Indian Paintbrush. There are 22 different species of Indian Paintbrush. 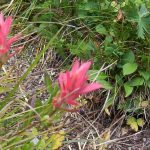 The ones you are most likely to see in Glacier Park are the Split-Leaved Indian Paintbrush (pink or magenta), Harsh Paintbrush (bright red or scarlet), and Scarlet Paintbrush (bright red, scarlet, or crimson to red-orange). 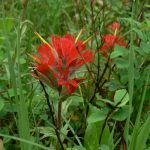 Indian Paintbrush will stand 8-36 inches tall with the leaf-like bloom at the top of the stem – the Split-Leaved Indian Paintbrush is the shortest in this group with the Scarlet and Harsh Paintbrush about the same height. The stem has long, lance shaped leaves from it base to the bloom. 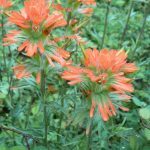 Indian Paintbrush can be found in valley meadows, alpine meadows, and open wooded areas. 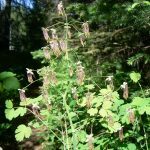 They will bloom earlier at lower elevations and can be seen along the Going-To-The-Sun Road in July and August. Another good place to see them is along the Highline Trail. Trillion is one of the early blooming Glacier National Park Wildflowers. Seeing them in open forest floors still moist from melting snow is a welcome sign of spring. They are a very distinctive plant with 3 egg shaped leaves connected to the 4-15 inch stem at the same point. A few inches above the leaves at the top of the stem will be a showy white 3 petal flower. As the flower ages it turns to lavender and then purple. Trillion are a long living plants. They have been know to live more than 70 years. They are also late to mature – a Trillion will be more than 18 years old before it blooms. The height of a Trillion indicates it’s age. One of the most unique Glacier National Park Wildflowers is the Western Meadowrue. The male and female flowers are on separate plants. Neither flower has petals and both are a purple pink in color. The male flowers look like a wind chime with pistils that quiver in the slightest breeze. The female flowers looks like little star bursts. The plant stand up to 3 feet tall with columbine looking leaves. 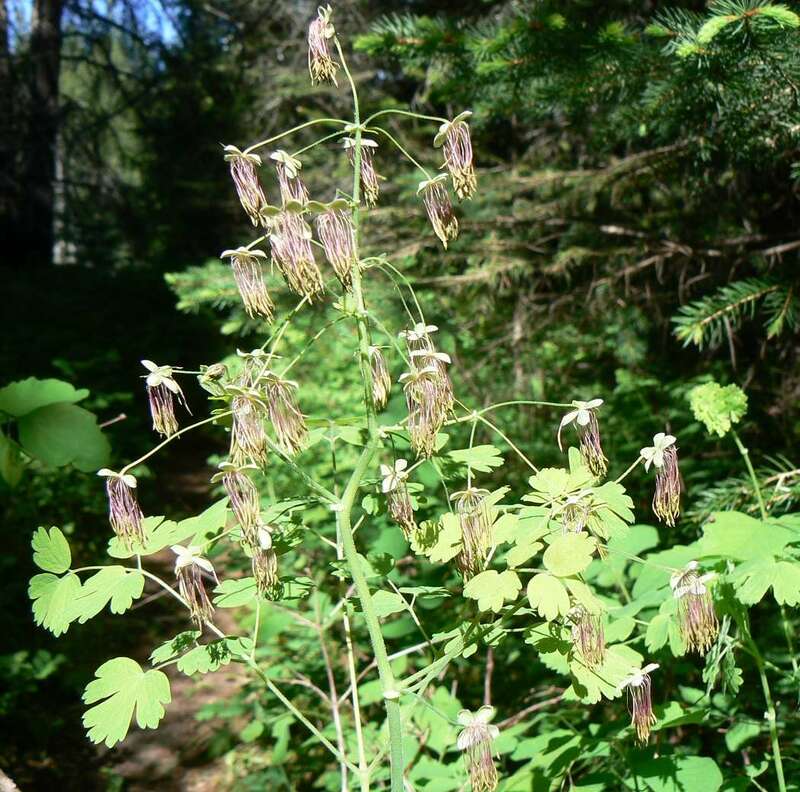 The leaves of the Columbine originate from the base of the plant where the Western Meadowrue’s leaves are all along the main stem. 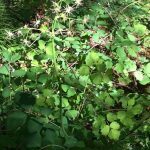 You can find the Western Meadowrue along the St Mary Falls/Virginia Falls trails, the Avalanche Lake Trail or many other trails. 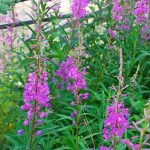 You are likely to see Fireweed in many areas of Glacier Park. 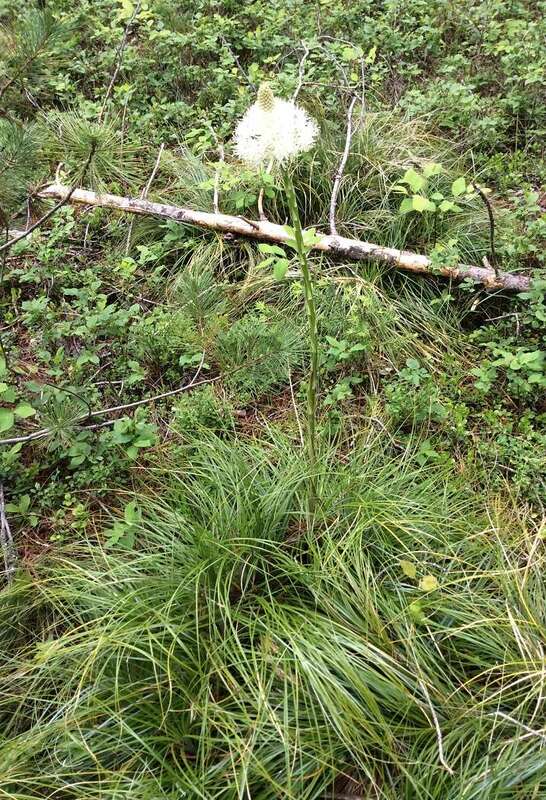 Fireweed are some of the first plants to grow in areas affected by forest fires. Their seed spread easily and rapidly by wind so they will become the dominant species for the first few years. Fireweed have numerous showy pink flowers at the top of an unbranched stem. They are 3-9 feet tall. 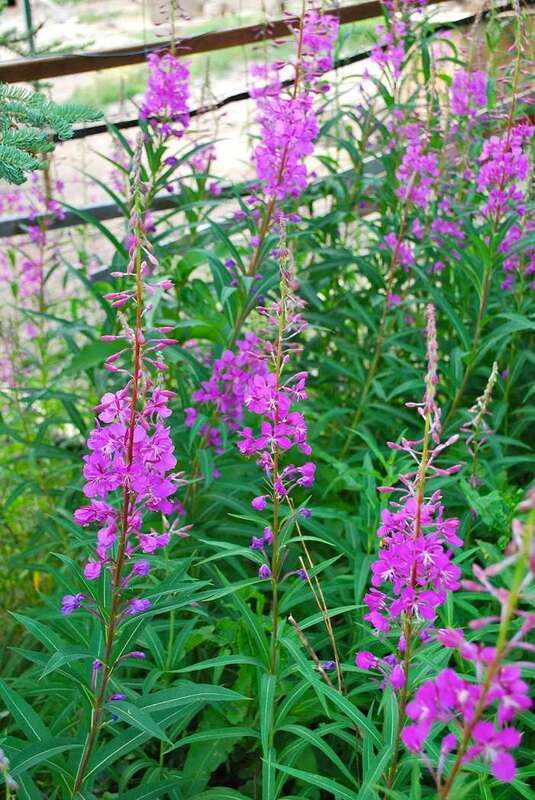 You can find Fireweed in places other than forest burn areas. There are very large fields of Fireweed along the Going-To-The-Sun Rd at Haystack Creek and at Big Bend. 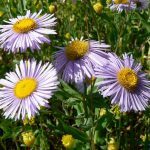 Two of the most difficult Glacier National Park Wildflowers to differentiate between is the Leafy Aster and the Showy Fleabane Daisy. 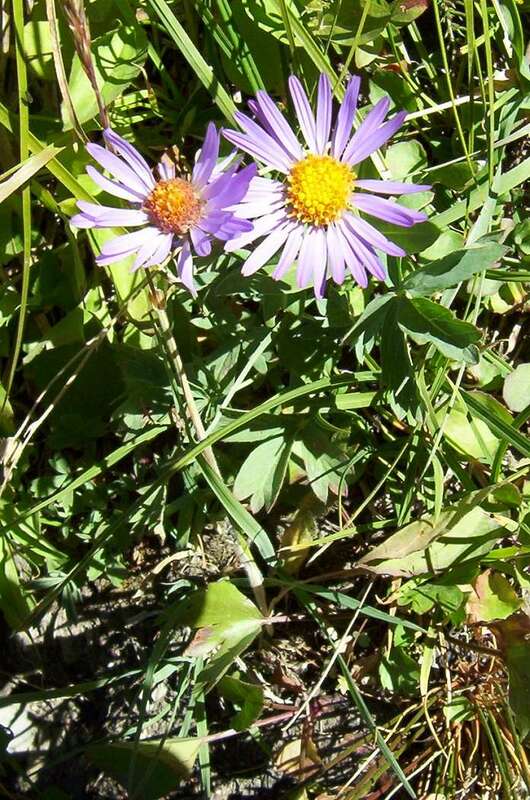 They are both members of the aster family and have purple petal-like rays circling a golden yellow disk for their blooms. 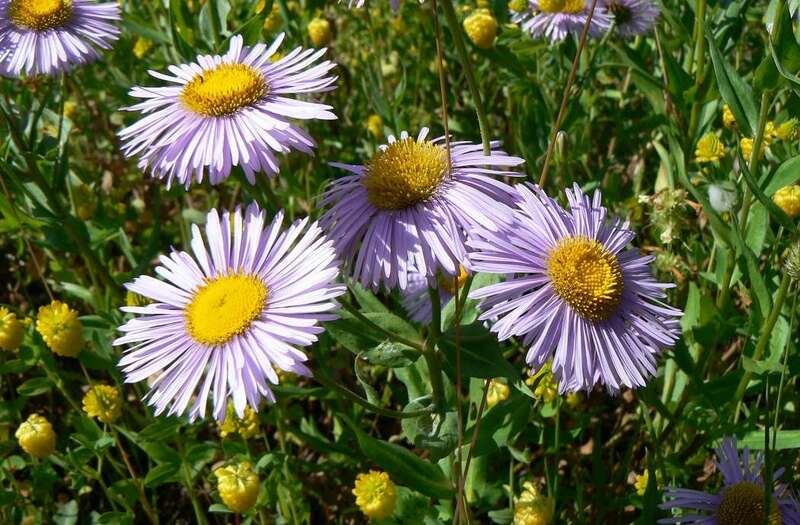 The leaves on the Leafy Aster are wider and longer than those on the Showy Fleabane Daisy. But the leaves on both plants will be all along the stem. 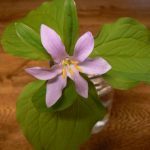 You can find both of these wildflowers along most of the trails in Glacier Park. 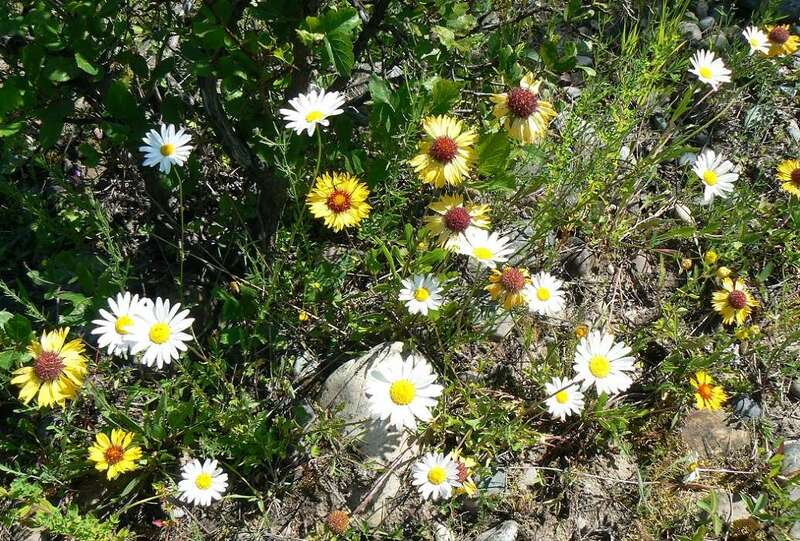 The Showy Fleabane Daisy will typically bloom a little earlier in the year than the Leafy Aster but both can be found from valley forests to subalpine forests. 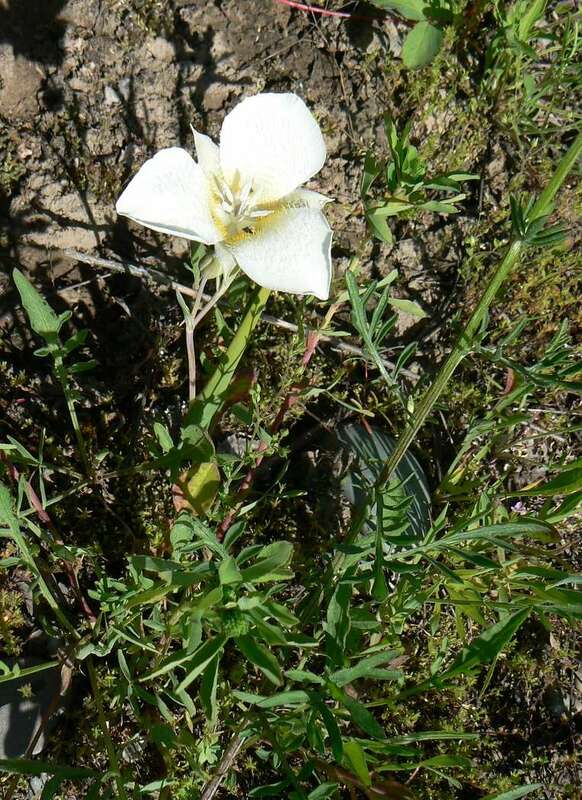 Pointed Mariposa Lily is one of the easiest Glacier National Park Wildflowers to view. They exist along many of the trails in the park. 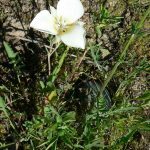 The Pointed Mariposa Lily has a breathtaking white flower with 3 petals lined with white hair on the outer edges of the petals and yellowish hair on the inside of the petals which makes it look like it has a yellow center. The stem is 4-12 inches tall with a single flat basil leaf from the base of the plant and a few smaller flat basil leaves farther up the stem. Some of the trails we’ve seen them along are Avalanche Lake Trail, St Mary Falls/Virginia Falls Trail, Highline Trail, Bowman Lake Trail, and many others. A member of the lily family, Queen’s Cup Beadlily has a single white flower sitting a top a 3-8 inch stem. It has 2 or 3 basal type leaves 3-8 inches long extending up from the base of the stem. The flower has 3 slender petals and 3 sepals which look like the petals and spread outward in the shape of an open bell. 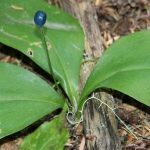 As the season progresses, the flower of the Queen’s Cup Beadlily is replaced by a single deep blue or purple inedible berry. This is another Glacier National Park Wildflower which can be viewed along many trails in the park. Some of the trails we’ve viewed the Queen’s Cup Beadlily is St Mary Falls/Virginia Falls Trail, Avalanche Lake Trial, Hidden Lake Trail, Highline Trail, Quartz Lake Loop Trail, and many others. When you find Bunchberry, you’ll find a dense patch of them. These Glacier National Park Wildflowers exist in dense patches because the plants spread on underground stems. 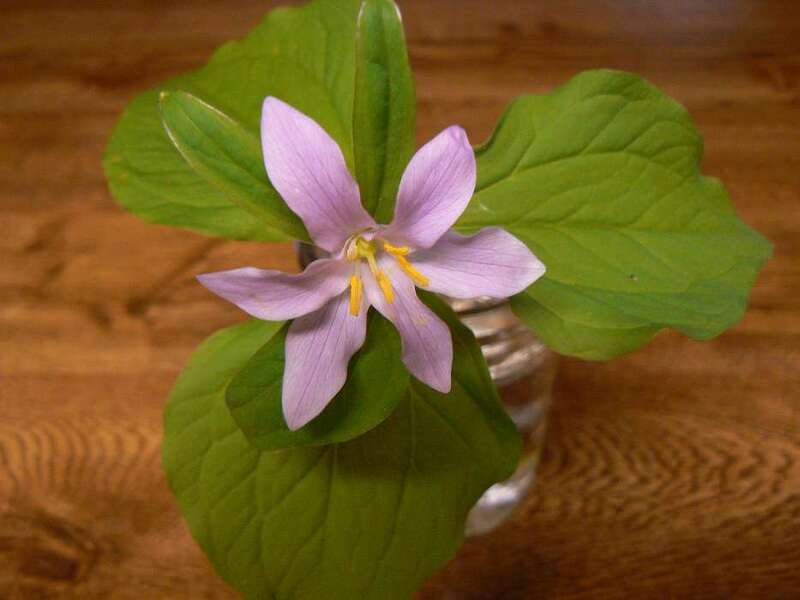 It is a low growing plant, 4-6 inches tall, with 4-7 leaves at the top of the stem in a whorl (the leaves originate from a common point). 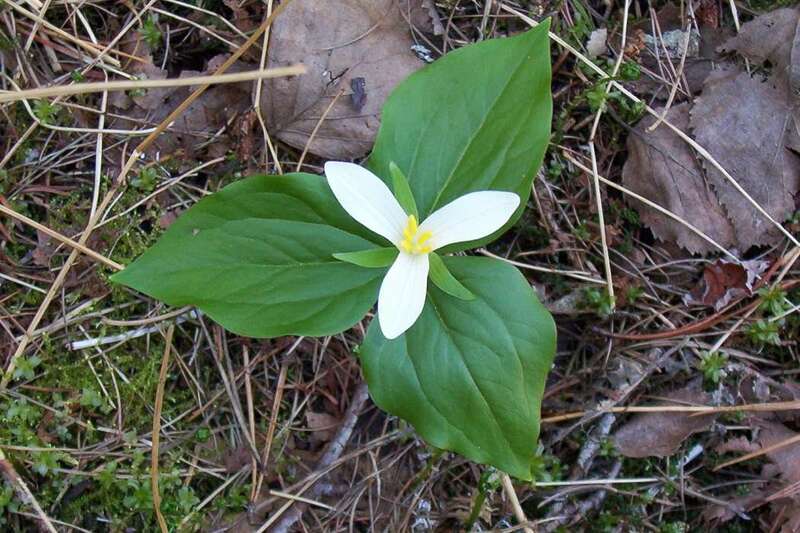 The Bunchberry has 4 white bracts above the leaves often mistaken for petals. But upon closer examination, the bracts surround a cluster of tiny yellow flowers. 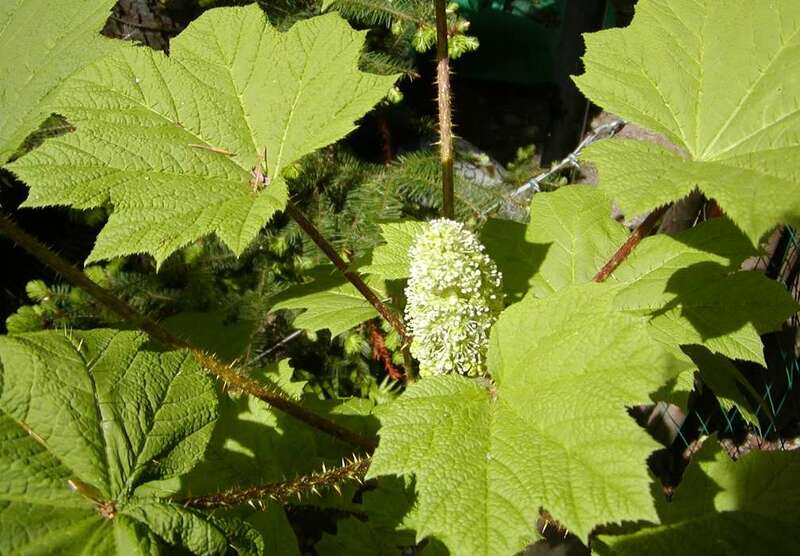 Later in the season, these flowers will produce a cluster of bright coral red berries. These berries are edible but are not favored by everyone. 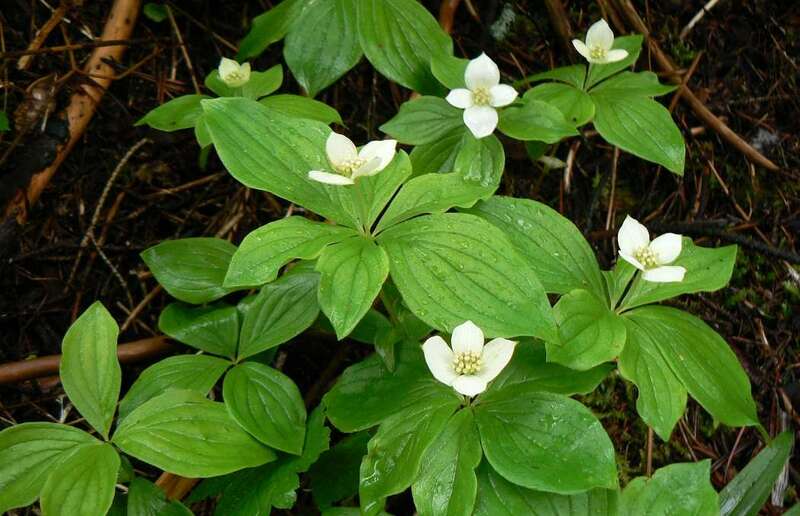 The Bunchberry is a member of the Dogwood family. 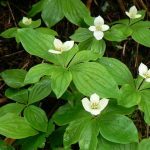 You can find Bunchberry plants in the deep woods along Apgar Lookout Trail, Avalanche Lake Trail, and many others. Just before you reach Avalanche Lake on the Avalanche Lake Trail, you’ll encounter a large dense patch of Devil’s Club. Devil’s Club gets it’s name from it’s club shaped woody stem anywhere from 3-9 feet tall. Along the stem are stiff, sharp spines up to ¾ inches long. Devil’s Club has huge maplelike leaves often over 12 inches broad. The leaves also bear sharp spines on their veins. 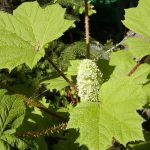 Devil’s Club has small globe shaped umbels of greenish white flowers along a 10 inch flower stalk. The flowers produce a cluster of bright, shiny red berries. 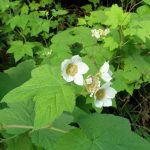 Thimbleberry is a member of the Rose family and related to the raspberry and blackberry. It has large maplelike leaves up to 10 inches wide. 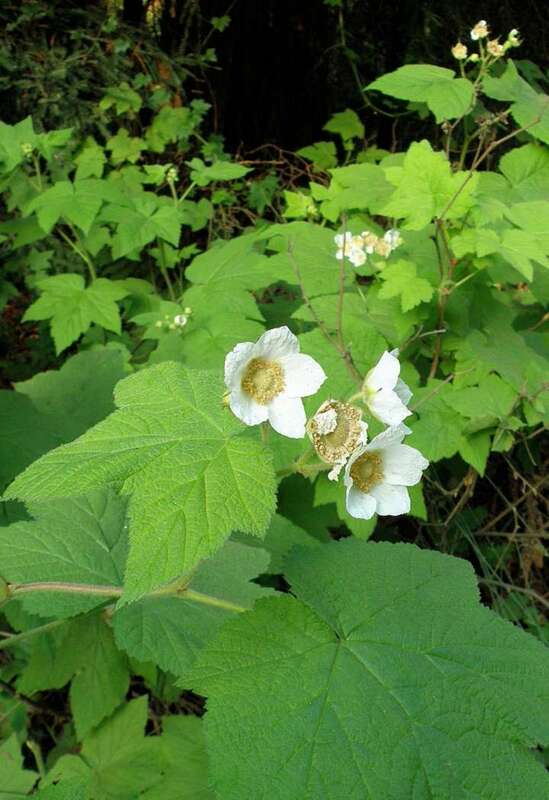 Thimbleberry plants are usually 2-4 feet tall. 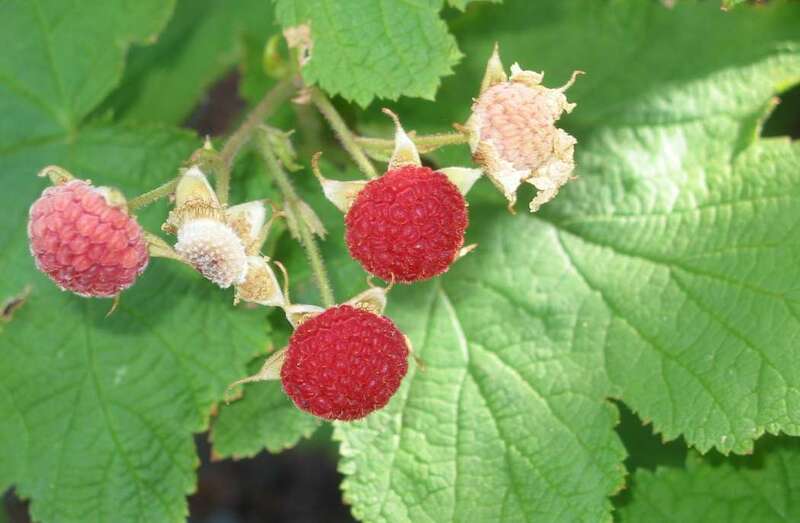 Unlike raspberries and blackberries, their stems do not have thorns. 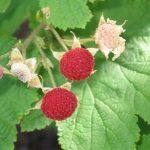 Each plant will have several 1-2 inch wide flowers which will produce a berry that resembles a raspberry. The berries are edible, tart, and easily fall off when ripe. These Glacier National Park Wildflowers usually grows in large patches and can be found along the Running Eagle Falls Trail, Twin Falls Trail, St Mary Falls Trail, and many others. 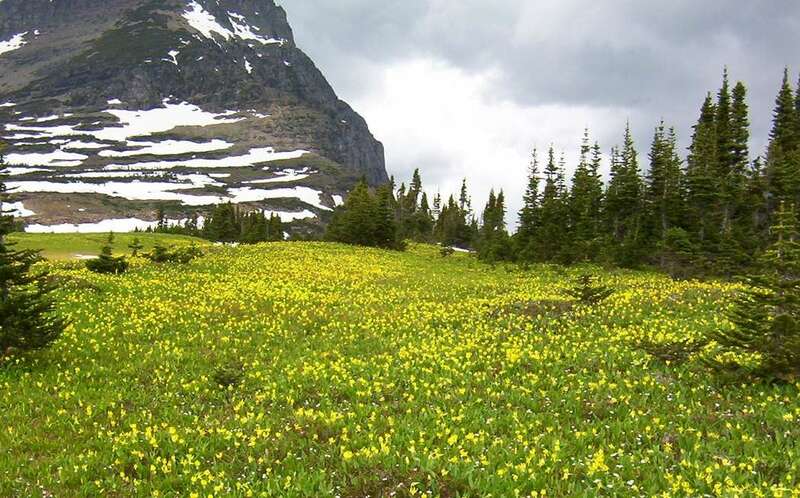 If you are fortunate enough to visit a mountain meadow just after the snow melts off you have a good opportunity to see the Glacier Lilies blooming. Glacier Lilies are a showy yellow flower with 6 petals bent backwards towards the base of the flower. The bloom sits on top of a 2-15 inch stem with 2 broad leaves protruding from the base of the stem. One of the best places to see them is along the Hidden Lake Lookout Trail behind the Logan Pass Visitors Center. You could anticipate them to bloom in this area anytime from July and into August depend on the snow pack from the previous winter. It doesn’t matter whether you visit Glacier National Park in June or September, wildflowers season in Glacier National Park is always active. Even those wildflowers that normally bloom in June at lower elevations can still be in bloom in September at higher elevations. But whatever trail you choose, you’re sure to find some Glacier National Park Wildflowers.